We really ought to start with the Screveton Golden Pippin, named after the village we work in. Unfortunately we can’t, as we don’t have any. Nobody seems to and we only heard of it after we started planting the trees – one day we will have one. Meanwhile here are some of the other varieties we grow. Traditional Victorian cooking apple that was also used for eating and juice. Bred by Mrs Peasgood of Stamford, Lincs around 1858. 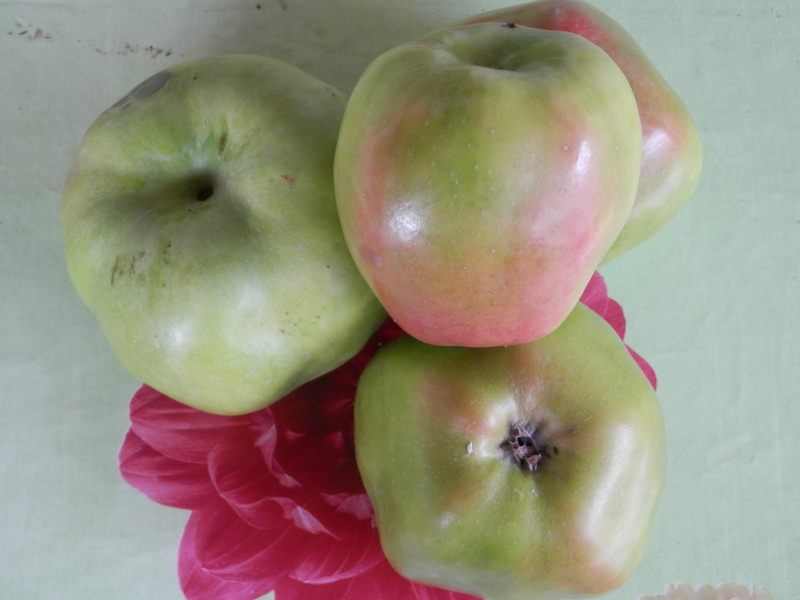 Descended from Catshead Codlin, but more versatile and better looking..
Large, juicy and sharp flavoured – a typical cooking apple. Also listed as a cider apple by the RHS. Can produce very large fruit of good shape, making them a favourite for exhibitions. Hardy, and will grow on clay soils. Good for puree as cooks down easily, has a tangy flavour and needs little extra sugar. Ripens mid-season and store until the later apples are ready. It appears that Stamford was a centre of apple breeding in the nineteenth century, with 44 varieties claimed, though only a few are known to survive. We’ve just eaten the one on the right of the picture, which was quite a pleasant experience. 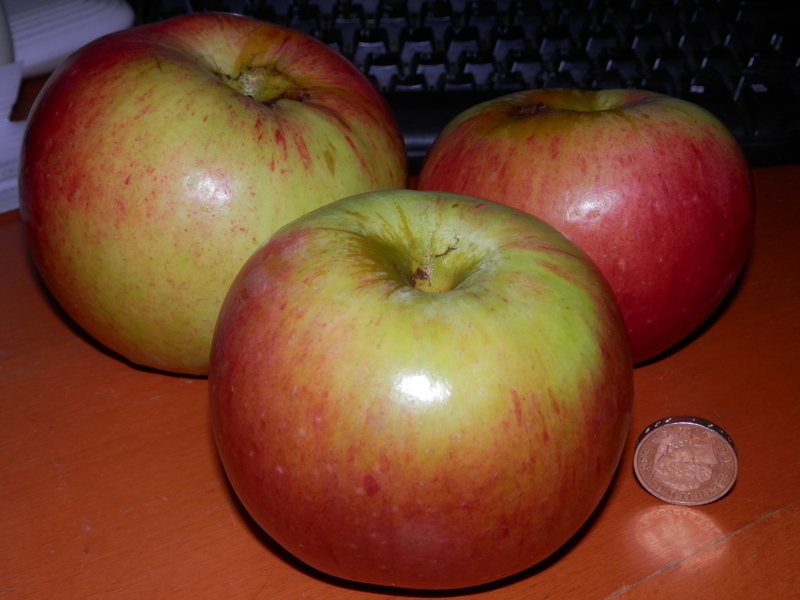 It’s a little sharp, but not unpleasant, and I’ve had a few supposed eating apples that were sharper. It’s slightly sweeter than a Bramley, nice and crisp and easy on the eye. The only problem is that even the small one we ate was enough for two people. I can see how it was treated as a dual purpose apple but you’d need to share. Large Victorian cooking apple from Cheshire, first noted in 1862. Also used for juice. Produces a sharp, textured puree as it keeps its shape when cooked down. A hardy variety that performs well in Scotland and the north of England. Recommended as a plant for pollinators by the RHS. We used ours for juicing when we picked them last week and they produced a dark brown juice. It was a bit too sharp for some tastes, though I actually prefer it that way.